Feryal Abbasi-Ghnaim is master Palestinian embroiderer. Born in the city of Safad in northern Palestine, her family fled to Syria and Jordan in 1948. After attending boarding school in Ramalla West Bank, Abbasi-Ghnaim returned to Syria to attend Damascus University, where she majored in art history. In 1980, her family immigrated to the United States. 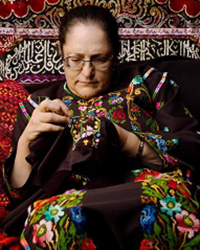 Abbasi-Ghnaim has dedicated herself to practicing and teaching her traditional craft. She has lectured and taught about Palestinian traditions at the University of Massachusetts, the Oral History Center of Cambridge, Portland State University, and Lewis and Clark College. She has collaborated with the World Affairs Council of Oregon and the Middle East Studies Center to participate in the “Teach the Middle East” forum, a set of workshop designed to train youth and K-12 educators about Middle East culture and arts. Since 2000, Abbasi-Ghnaim has taught workshops and classes in public schools in Beaverton, Milwaukie, Gresham, and Portland. Abbasi-Ghnaim earned Traditional Arts Apprenticeship Program awards with Oregon Folklife Network in 2012, 2014, and 2018 and worked extensively with the OFN’s predecessor folk and traditional arts programs in prior years. This entry was posted in Artist Profiles, TAAP. Bookmark the permalink.